A winter storm watch has been issued for Toronto ahead of a messy weather system expected to hit the GTA on Tuesday. Snow and ice pellets, possible freezing rain, and strong winds are expected to begin early Tuesday morning and last through the day as a Colorado low moves into the province. “Snow will mix with or change to ice pellets later Tuesday. Strong easterly winds gusting to 80 km/h will cause reduced visibility in blowing snow,” Environment Canada said in its storm watch Monday. 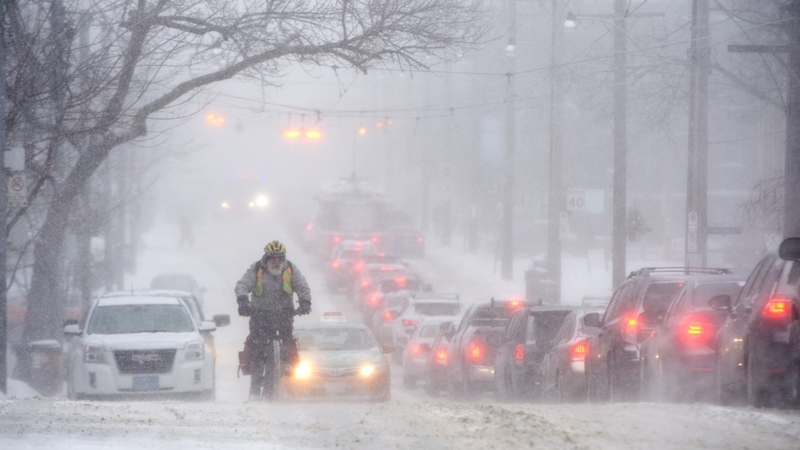 The storm system, which is expected to hit most of southern Ontario, will dump anywhere from 15 to 20 centimetres of snow and ice pellets on the region, Environment Canada said. There is also a risk of freezing rain, which could result in power outages. The agency also warned that travel could be hazardous and that there could be a significant impact on rush hour traffic in major urban areas. The City of Toronto also issued an extreme cold weather alert Monday. The overnight temperature is expected to dip down to -9 C tonight, but will feel more like -19 with the wind chill. That temperature is expected to persist into Tuesday morning before going up to feel like – 9 Tuesday afternoon. The city’s extreme cold weather alerts are issued when the temperature is forecast to reach -15 degrees C or colder, or when the wind chill is forecast to reach -20 or colder. The alert activates expanded shelter space and services for the city’s homeless population and will remain in effect until further notice from the city. Centennial College said it will be closed on Tuesday due to severe weather expected. "All classes, daytime and evening, are cancelled, as are all campus services," a news release said on Monday night. "The college's child care centres will also be closed for the day." George Brown College also said it will be closed on Tuesday.